← Why is there no Weblogic WLST Node Manager nmShutdown command ? If you ever checked your Weblogic production logs and found the Security Alert below, then your Weblogic domain has a huge gaping security hole. Even if you don’t want SSL communication for your webservices or applications. The internal (administrative) processes in your Weblogic domain still relies on the default demotrust and with this everyone can access your domain. 0020: E9 B7 D9 7C E2 23 33 A4   B7 21 E0 AA 54 2B 4A FF  .....#3..!..T+J. We first generate a java keystores containing a private key for each physical server, since SSL hostname verifiation is based on machine names. We use “welcome1” as password here, but make sure to choose a complex password here, use it during these steps and then lock it safely away. Is CN=server01, OU=, O=Rubix, L=, ST=, C=NL correct? Repeat step 1 + 2 for each physical server, replacing the -alias parameter, -keystore parameter and CN name with the correct server0* value. Now comes the tricky part that you probably need some outside forces. You will need the correct Certificate Authority to sign your certificate requests (the .CSR files you generated). You can create your own CA and self-sign them, but I would not recommend that unless you know what you are doing and understand the consequences. You could use an external Internet CA provider, but this becomes very costly and time consuming when you need such an external provider to sign every SSL enabled server in your landscape. The best situation for us would be if the current organization already has an internal CA provider, especially when the rootCA is trusted by the servers and machines in your landscape. Let’s assume however that you receive the signed response, including the public keys of the rootCA and a intermediateCA. CA instances often use a intermediate CA to authorize certificates, so if they have “problems” they can withdraw this intermediate CA and don’t need to withdraw the whole RootCA making it useless. So the situation should be that you know hold 3 PEM/DER files. Repeat these steps for server02 and server03. So we know have 3 identity keystores for each server containing the signed private key and it’s certificate chain. Now let’s generate a truststore for each server. Altough you can use the identical keystore for both identity and trust, it’s always a good practice to separate them. The identity keystone contains the private key and normally never changes during it’s lifetime, so you should secure it with a complex password. The trust store contains the certificates that you trust and as your middleware landscape grows, this file might grow and more administrators will need access to it. Example generating the truststore for server01, repeat for 02 & 03. The nodemanger by default uses the demoIdentity and demoTrust keystores. So on each server hosting a managed server (server02 and server03) we will need to change this. Restart the NodeManager to activate the changes. The passwords in the properties file will automatically become encrypted. For server rbx_dev_soa_ms03, the Node Manager associated with machine server03 is not reachable. All of the servers selected are currently in a state which is incompatible with this operation or are not associated with a running Node Manager or you are not authorized to perform the action requested. No action will be performed. Your AdminServer can not communicate with a node manager. Make sure it’s running, check Environment -> Machines in the Weblogic console if the machine has state reachable, check if the address configured there, and the address in the nodemanager.properties and the CN-name used in SSL have the same value, check if Weblogic and Nodemanager use the same SSL configuration (trust+identity). Log in the Weblogic console (in our case http://server01:7001/console) and make sure that each server has the SSL port enabled. You can find the setting “SSL Listen Port Enabled” for each server under “Configuration -> General”. Enable it and make sure you use a correct and free port. For each server (Admin + MS) we have to change the KeyStore configuration. For each server (Admin + MS) we have to change the SSL configuration. When you are finished restart your whole Weblogic environment (Admin + MS). Enabling SSL takes a lot of steps, and we didn’t even mentioned it for enabling SSL client identity in OSB (Service Key Provider) and communication with an LDAP over SSL. But there’s more to come I guess. Please be carefull when you have followed the EDG and separated adminserver from managed servers on different machines. 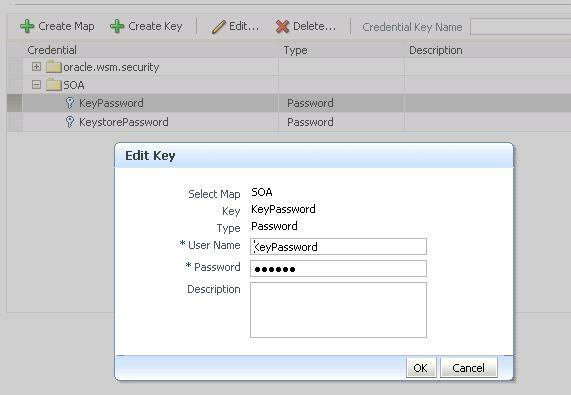 This keystore is not copied from the adminserver to the managed server by weblogic, you have to do this manually. Other products might have installed keys in this default-keystore.jks (located at $DOMAIN_HOME/config/fmconfig) e.g. IDM installs a key with alias xell. If you change the keystore you have to move these keys too. Since these are private keys, which cannot be exported with keytool. I recommend using pkeytool for this ( http://pkeytool.couchpotato.net). I would advise to always check the default key for existing keys before changing the value in /em. Hi Jacco, thanks for the input. Another thing I find weird from the EM configuration is the fact that it doesn’t allow you to configure different keystores for each instance. Weblogic allows unique SSL configuration for each Managed Server in the domain. So no problem there if these are running on different machines with different hostnames. I believe step 10.1 is not necessary anymore, and everything is handled in WLS now-a-days. The error in 10.3 is what I got when I didn’t configure the mapping (which holds no keystore filenames, just passwords). The steps in 10.2 do contain a specific filename where I used the hostname as part of it. This I guess would mean that if you have a cluster of multiple MS servers hosting your SOASuite you will eventually need to make sure the keystores all have an identical filename (step 10.2) and identical password (step 10.3). I’m still stuck to get SSL communication to work between Weblogic and OID (configured in the the OIDAuthenticator). Got it working with Active Directory however OID is puzzling me. I succeeded changing the Wallet configuration of OID allowing it to use the new private identity and correct thrusts. However when I change the WLS configuration to SSL I can see in my Weblogic logging that it expects an SSL handshake from OID but remains getting clear-text communication. The whole configuration still works, but I’m not able to “force” OID to actually use SSL. Thank you for the post. really helped to gain knowledge on SSL from novice to expert. Please do post on enabling SSL client identity in OSB (Service Key Provider). Thank you. I’m starting to walk a similar path. The difference is that we have configure the Administration Server listening in a DNS name that points to a virtual migratable IP address. In this way, we can startup the AdminServer in any of the hosts that are used by prodcution cluster. Our cluster is composed by 4 different host, each of them running 3 managed servers, and the admin server in one of them. Alse, the cluster is behind a hardware loadbalancer and the users use a unique URL. Is there any consideration when using this schema? Hello, I didn’t create any private key using keytool but I received PFX from our company Admin. I converted PFX to PEM and I see private kay and server certificate but not root and intermediate. 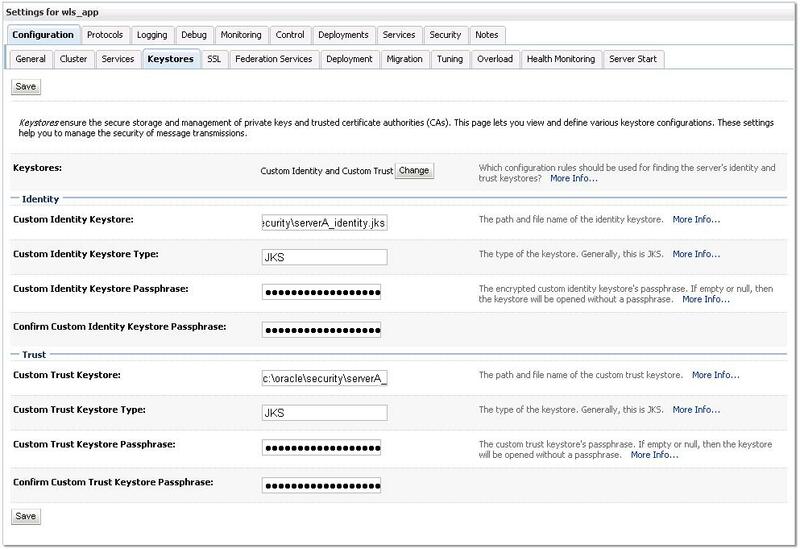 4) Configured the keystore using custom identity and standard trust option. 6) But when checked the URL using http://www.sslshopper.com/ssl-checker.html, the cheker says that certificate chain has broken. Even our clients who consume the services also complain the same. Hi Jan, very informative as usual. Is there a way to automate the configuration of EM? I don’t want to click around, I am just lazy. I coulԁn’t refrain from commenting. Very well written!